Ricky Martin and his fiancé Jwan Josef enjoyed a stay in Punta de Mita, while soccer player Giovani Dos Santos visited Nuevo Vallarta; Victoria’s Secret model Shea Marie was also spotted in Punta Mita. The news that Ricky Martin was on a beach somewhere in Mexico accompanied by his fiancé, visual artist Jwan Yosef, hit the airwaves at the beginning of the week, but it wasn’t until December 6th when he published an official pic on Instagram that it was identified as being in the Riviera Nayarit. A local paper confirmed the rumors with the exclusive scoop the couple would be staying from December 4-9 in a private residence in Punta de Mita. Ricky’s backup dancers, Kupono Aweau and Tatiana García, also visited the Destination after they ended their tour. Giovani Dos Santos, player for the Selección Mexicana and Los Angeles’ Club Galaxy visited Nuevo Vallarta, specifically the Vidanta compound, where he stayed for a few days and took some golf lessons this week. Continuing the sports theme, Washington Nationals baseball player Mark Melancon spent a few days with his family in Punta Mita. 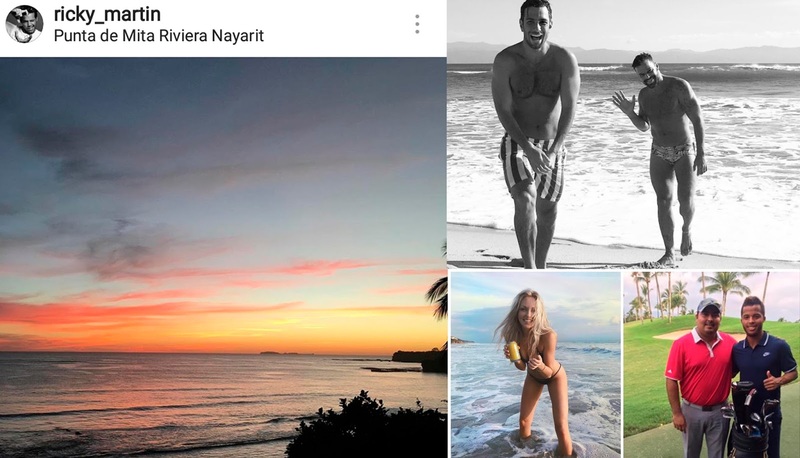 One of the lovely Victoria’s Secret Angels, Shea Marie, stayed at the W Hotel Punta de Mita and, among other things, was seen enjoying Sayulita and the Islas Marietas. Cheryl Woodcock, producer, model and TV hostess specializing in surfing, visited Punta de Mita and Sayulita for a few days of surfing. Everything points to her staying at The St. Regis Punta Mita Resort. Several models from around the world have been vacationing in the Riviera Nayarit this winter, among them Canadian Courtney Kitt, Ricardo Korkowski and Mau Poil from Mexico; Brazilians Amadeo Leandro and Bruno Santos; Australian Jordan Berret and Aya Jones, from France.